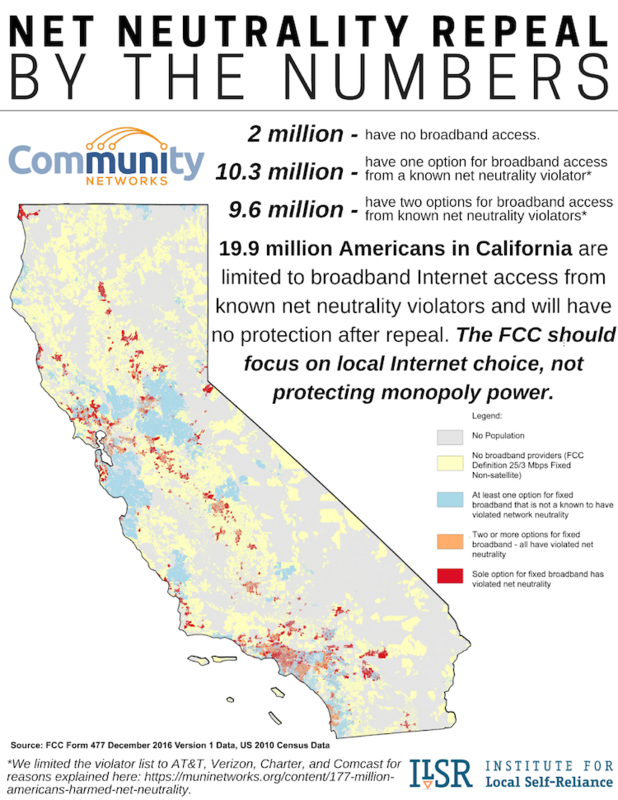 Update 12/20/2017: Original maps generated on December 11th understated the population of Americans forced to obtain services from known network neutrality violators. The problem is even greater than we originally calculated, particularly in New York. End update. This Thursday, December 14th, the FCC plans to remove network neutrality protections. Republican Commissioners and Chairman Ajit Pai justify the decision by claiming that the market will naturally protect subscribers from predatory big ISP behavior. Unfortunately, the FCC’s own numbers disprove their theory. We dug into the data that reveals how 177 million Americans will be left without any market protection following net neutrality repeal. Using FCC 477 data, we created a visualization of relevant data. 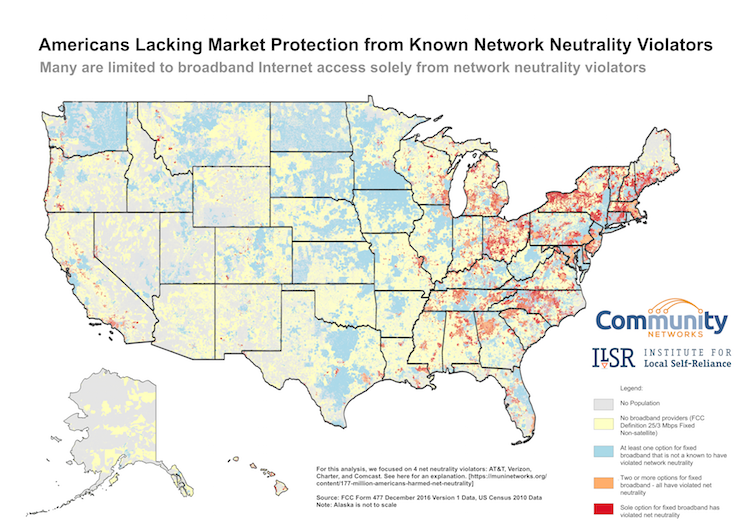 This map focuses on the people and businesses at greatest risk - where they are limited to options from providers that have violated network neutrality in the past or have admitted the plans to violate it in the future. For a larger image, download this version [18 MB png]. 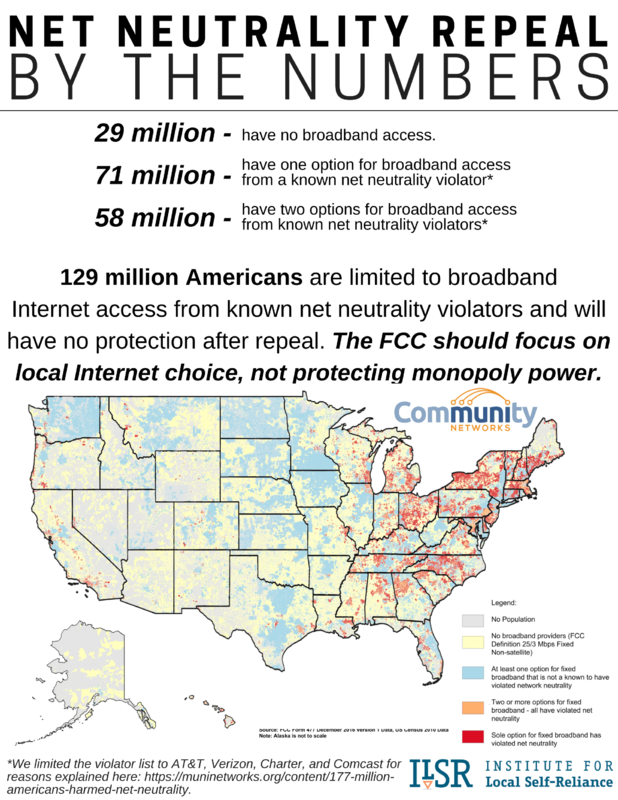 Download Net Neutrality Repeal By The Numbers, U.S.A. Edition, fact sheet here. The results are not inspiring. More than 129 million people are limited to a single provider for broadband Internet access using the FCC definition of 25 Mbps download and 3 Mbps upload. Out of those 129 million Americans, about 52 million must obtain Internet access from a company that has violated network neutrality protections in the past and continues to undermine the policy today. 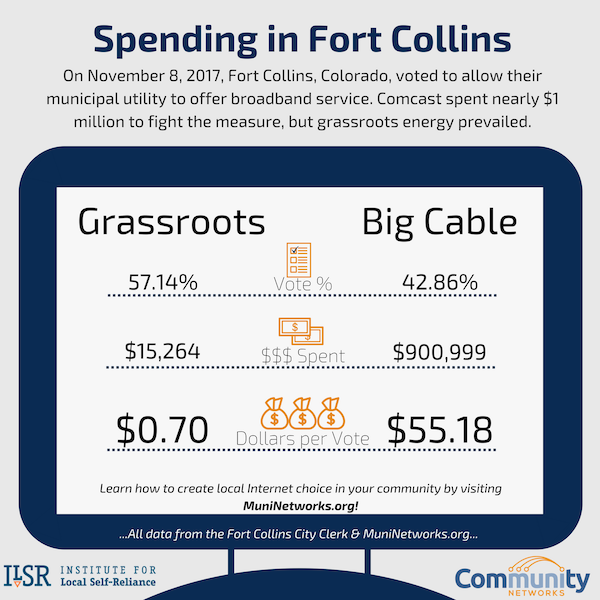 A month ago we were following the election in Fort Collins in which Comcast had invested heavily to oppose a measure to allow Fort Collins can pave the way for a future municipal network. Comcast lost their bid to buy the election and their recent campaign report reveals that the bankroll they spent was much more than anyone realized. When we analyzed Comcast’s investment in the Fort Collins election for our report, Comcast Spends Big on Local Elections: Would Lose Million in Revenue from Real Broadband Competition, we looked at the logic behind the big ISP’s investment to stop measure 2B. At the time, the front for Comcast and CenturyLink, Priorities First Fort Collins, had only spent about $200,000. Within two weeks of releasing our report, that figure rose to more than $450,000. The last campaign report, filed in early December, reports that the organization spent approximately $450,000 more. All told, the total amount spent by Priorities First Fort Collins for the compaign came to a whopping $900,999. The grassroots organization Fort Collins Citizens’ Broadband Committee spent a little more than $15,000. The measure to pass 2B to allow Fort Collins to amend its charter to simplify moving forward with a municipal network utility passed with 57 percent of the vote. Learn about what it was like in the trenches for the Fort Collins Citizens' Broadband Committee by listening to Christopher interview Glen Akins and Colin Garfield in episode 282 of the Community Broadband Bits podcast. Voters in 18 19 Colorado communities chose local telecommunications authority with an average rate of 83 percent. In Fort Collins, voters weren’t swayed by rivers of cash Comcast threw at them in the final month leading up to a ballot issue to pave the way for local fiber optic Internet infrastructure. By a comfortable margin, ballot measure 2B passed, allowing the city to proceed as it examines ways to improve competition and connectivity. Voters chose to amend the city charter in order to give the city council the ability to authorize the municipality to offer telecommunications services as a utility, rather than taking the issue to the voters in a separate referendum. The measure passed with a comfortable margin: 57 percent of voters approved the proposal. The city has been investigating ways to improve connectivity for several years now because CenturyLink and Comcast are only providing a patchwork of substandard services. As a forward thinking community, Fort Collins wants to be sure that they don’t pass up any economic development opportunities. City leaders also feel that a municipal network is best positioned to offer affordable Internet access as a way to create an environment that is equitable and inclusive, especially for Fort Collins schoolchildren. The city is home to Colorado State University, which needs high-quality connectivity for research purposes. When considering the city’s social, economic, and development goals, the future ability to invest in Internet infrastructure makes sense. Comcast sees the measure as potential competition, the ultimate threat. In order to allow the City Council to, at some date in the future, authorize the city municipal utilities to provide telecommunications services, Fort Collins needs to amend its city charter. Without this amendment, the City Council will need to take the issue to the voters, rather than by granting permission via ordinance. If Fort Collins decides to work with a private sector partner to deliver services, these same restrictions apply. December 8th Update: WOW! The latest campaign report discloses that Priorities First spent a total of $901,000 during this campaign. Congrats on overcoming that Goliath, Fort Collins! Fort Collins Update: On November 3rd, Comcast's front group Priorities First filed their most recent campaign report. The report showed that the group spent and additional $256,326 on the Fort Collins campaign between October 23rd and November 1st. This brings big incumbent spending to stop compeition to almost half a million dollars. As the company with one of the largest ISPs in the nation, Comcast Corporation makes daily investment decisions. They choose to put company funds into a variety of ventures, from theme parks to hair color; all that matters is that the investment pays off. This election season, Comcast is once again devoting funds to an investment it considers necessary - influencing elections in Seattle and Fort Collins, Colorado. We've prepared a policy brief to look deeper into Comcast's investment into the elections. Download the brief here: Comcast Spends Big on Local Elections: Would Lose Millions in Revenue from Real Broadband Competition. As the company with one of the largest ISPs in the nation, Comcast Corporation makes daily investment decisions. They choose to put company funds into a variety of ventures, from theme parks to hair color; all that matters is that the investment pays off. During the 2017 election season, Comcast once again devoted funds to an investment it considered necessary - influencing elections in Seattle and Fort Collins, Colorado. We prepared a policy brief to look deeper into Comcast's investment into the elections. In Seattle, Comcast and CenturyLink donated $50,000 to a political action committee that supports a candidate opposed to publicly owned Internet infrastructure. This is only the latest attempt of the two national ISPs to influence the city’s mayoral elections; in 2013, they contributed similarly to Ed Murray, who went on to win the election. Murray was also opposed to the publicly owned option. In our analysis, we ran a range of possible scenarios and offered both a conservative Comcast loss estimate and figures based on higher loss of subscribership. We also accounted for rate adjustments due to the effects of competition and considered the losses Comcast would face when subscribers abandoned video services. Check out the policy brief for more results and details on our methodology.